Just how much economic trouble is China in? To judge by global markets, a lot. In the first few weeks of the year, stock markets around the world plummeted, apparently thanks to China. The panic was triggered by an 11% plunge on the Shanghai stock exchange and by a small devaluation in the renminbi. Global investors—already skittish following the collapse of a Chinese equity-market bubble and a surprise currency devaluation last summer—took these latest moves as confirmation that the world’s second-biggest economy was far weaker than its rosy headline growth numbers suggested. At the World Economic Forum in Davos last week, two of the world’s most prominent hedge-fund billionaires, George Soros and Ray Dalio, warned that China is headed for a hard landing and may be forced to devalue its currency even more. It is tempting to argue that markets are overreacting. After all, China’s economy grew by a solid 6.9% in 2015. Financial media headlines bewailed this as “the lowest growth rate in a quarter century,” but neglected to mention that this is still by a good margin the fastest growth of any major economy except for India. Even at its new, slower pace, China continues to grow more than twice as fast as developed economies. There are some doubts about the reliability of China’s economic statistics, of course, but most credible alternative estimates (based on hard-to-fake indicators of physical output) suggest that China is growing at around 6%, and that if anything there was a slight pickup in activity in late 2015. The tumult on equity and currency markets can be explained as an uncomfortable but necessary part of the country’s transition from an investment-led command economy to a consumer-led market economy. This sanguine reading is partly true. China is unlikely to see a collapse in economic growth any time soon. Construction and heavy industry, the mainstays of its growth from 2000 to 2013, are faring poorly, but the service economy and consumer spending remain strong, underpinned by strong employment and wage gains. Everything is slowing down a bit, but another year of 6%-plus growth should be achievable in 2016. Nor is financial crisis a serious short-term risk, despite the breathless discussion of capital fleeing the country. Most of the so-called “capital flight” is simply a matter of companies prudently paying down foreign-currency debts, or hedging against the possibility of a weaker renminbi by shifting their bank deposits into dollars. In the main, these deposits remain in the mainland branches of Chinese banks. Domestic bank deposits grew by a healthy 19% in 2015 and now stand at US$21 trillion—double the country’s GDP and seven times the level of foreign exchange reserves. So long as China’s financial system stays so securely funded, the chance of a crisis is low. 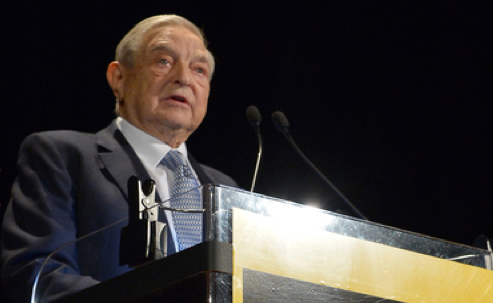 Yet in another sense, Soros and other investors are right to sound the alarm. China presents two risks that are more fundamental than the ones now catching the headlines. First, the global impact of its growth has contracted far more rapidly than the headline GDP numbers. Second, there are strong reasons to doubt that the government of Xi Jinping is really committed to crucial market-oriented reforms, because these would require an unacceptable dilution of Communist Party power. Until Xi steers a credible course in favor of markets, the world will endure more China scares. China’s economy is slowing only modestly in local-currency terms, but its contribution to global growth has already plunged dramatically from its peak. Remember that when China reports its GDP growth, this tells you how much its spending grew in inflation-adjusted renminbi terms. But to measure China’s impact on the world in a given year, it is better to look at its nominal growth—that is, not adjusted for inflation—in terms of the international currency, the US dollar. This is because nominal US-dollar figures better show the impact that Chinese demand has on the revenues of international companies, both in volume terms (buying more stuff) and in price terms (pushing up the prices of the stuff it buys). Viewed through this lens, China’s growth slowdown has not been modest and steady, as the official data show, but precipitous and scary. At its post-crisis peak in mid-2011, China’s nominal US-dollar GDP grew at an astonishing 25% annual rate. During the four-year period 2010-2013, the average growth rate was around 15%. By the last quarter of 2015, though, it had slowed to a tortoise-like 2.4%. In short, while investors are wrong to complain that China distorts its GDP data, they are right to observe that, for the rest of the world, China’s slowdown feels far, far worse than Beijing’s numbers imply. Worse, when we break down growth by sector, we find that industry and construction—which for years powered the demand for equipment, materials and commodities that made China the world’s leading importer—are in outright recession. In 2010-2013, these sectors reliably produced about US$100 billion more each quarter than they did in the year-earlier period. In 2014 this figure fell in half, to US$50 billion. By the last quarter of 2015 it was negative, to the tune of US$50 billion. In other words, if you are selling machinery or raw materials to China, your market isn’t simply growing a bit more slowly—it’s shrinking. In effect, the world has already experienced a China hard landing. This helps explain why markets react in such terror at every hint the renminbi might fall in value: a weaker renminbi reduces the dollar value of the goods China can buy on international markets, at a time when demand from its traditional industrial and construction sectors is already declining. This downshift in Chinese demand is part of a necessary adjustment away from the infrastructure-focused growth of the past towards a consumer-led growth model. But now we come to the second problem. Although China’s Communist Party leaders have professed their desire for this adjustment to a more market-driven economy, they seem unwilling to make any of the political sacrifices needed to make it happen. Ever since reforms began in the late 1970s, the Party’s desire to maintain absolute political control has lived in tension with its almost equally strong desire for a booming economy. For many years its leaders proved skillful at tactically surrendering control over ever-bigger pieces of economic real estate (agriculture, goods prices, housing, foreign trade, manufacturing) in ways that stimulated growth without undermining the party’s ultimate power. They gradually introduced markets that functioned pretty well most of the time, and intervened mainly to smooth out volatility, not to institutionalize false prices. This system worked thanks to two conditions. First, the main job was to pump more capital into the system, rather than to maximize the return on each dollar of capital. Second, the important markets were for physical goods (grain, pork, coal, houses). The government could regulate these markets by creating a pool of inventories and then operating a sluicegate that released these inventories or held them back, depending on whether the market was tight or in glut. Neither of these two conditions now applies. China has mobilized more capital than it can productively employ. Economic growth can no longer come from throwing more capital into the system; it must come from improving efficiency. To improve efficiency, new markets are needed—not the physical markets of the past, but financial markets. Unlike physical markets, financial markets cannot be controlled by inventory management, and they are intrinsically more volatile. Unfortunately, officials in Beijing have spent much of the last year trying to control financial markets in the same way they control the markets for grain and coal, with terrible results. In June, when a short-lived stock market bubble popped, they forced state-owned enterprises (SOEs) to buy up shares to stop the rout. This stabilized the market for a while, but left people wondering what would happen when the SOEs started selling down the shares they had been forced to buy. To enable SOEs to sell their holdings without disrupting the market, the authorities instituted a “circuit breaker” which automatically suspended stock-exchange trading when prices fell by 5% in one day. Instead of calming the market, this induced panic selling, as traders rushed to dump their shares before the circuit-breaker shut off trading. Similarly, Beijing got into trouble in August when it announced a new exchange-rate mechanism that would make the value of the renminbi more market determined. But because it paired this move with a small, unexpected devaluation, many traders assumed the real goal was to devalue the renminbi, and started pushing the currency down. So the People’s Bank of China (PBOC) intervened massively in the foreign exchange markets, spending down its foreign-currency reserves to prop up the value of the renminbi. This stabilized the currency, but undermined the government’s supposed commitment to a “market-driven” exchange rate. The motivations behind the stock-market and currency policies differ. The PBOC is genuinely, though clumsily, trying to establish a more market-driven exchange rate, whereas the stock market regulator is just trying to keep stock prices at an artificially high level. But the political constraints are the same: a government that refuses to let market prices rule when it thinks those prices are “too low,” and a system that adamantly flouts well-established international standards for transparency. At no point in the last six months has PBOC governor Zhou Xiaochuan stepped forward to explain what he is trying to achieve with his new currency policy. The leaders of the Federal Reserve, Bank of Japan or the European Central Bank would never dream of staying silent while global markets were being roiled by their actions. In short, it seems that when market-friendly measures conflict with the Party’s demand for control and secrecy, control and secrecy win out. This belies President Xi’s pledge three years ago to give market forces a “decisive role” in China’s economy. The lack of credibility of Xi’s market reforms makes it less likely that China will manage its difficult economic transition. For all their faults, Xi’s predecessors consistently gave domestic and foreign investors confidence that over time, there would be more space for markets and the private sector, even if there were plenty of potholes along the way. In economic reform, general direction matters more than speed. Today China is a country without a clear economic direction, and this shows up in a steadily slowing rate of private investment. The fault for this lies squarely with Xi. We have no idea whether Xi understands what modern markets require, or how he hopes to reconcile their demands with the Leninist-Confucianist paternalism he is busy imposing on the rest of society. China is unlikely to collapse. But it does risk losing its way. No hard landing in China. Time and again, momentum driven investors draw erroneous economic conclusions on the basis of pyrotechnics in financial markets. It’s happening again in early 2016. But the real side of the Chinese economy—the ultimate arbiter of a hard or a soft landing in any nation—is holding up much better than most believe. Yes, economic growth is slowing in China. The real story is not in the aggregate GDP but in important shifts in the mix of the Chinese economy. In 2015, an 8.3% expansion in the services sector outstripped that of the once-dominant manufacturing and construction sectors, which together grew by just 6% last year. The so-called tertiary sector rose to 50.5% of Chinese GDP in 2015, well in excess of the 47% share targeted in 2011, when the 12th Five-Year Plan, was adopted, and fully ten percentage points larger than the 40.5% share of secondary-sector activities (manufacturing and construction). This significant shift in China’s economic structure is vitally important to the nation’s consumer-led rebalancing strategy. Services development underpins urban employment opportunities, a key building block of personal income generation. With Chinese services requiring about 30% more jobs per unit of output than manufacturing and construction, combined, the tertiary sector’s relative strength has played an important role in limiting unemployment and preventing social instability—long China’s greatest fear and the most likely candidate for a smoking gun on the hard landing watch. Yet even in the face of decelerating GDP growth, urban job creation hit 11 million in 2015, above the government’s target of ten million and a slight increase from 10.7 million in 2014. The bad news is that China’s impressive headway on restructuring its real economy has been accompanied by significant setbacks in its financial agenda—namely, the bursting of an equity bubble, a poorly handled shift in currency policy, and an exodus of financial capital. Fortunately, China’s massive reservoir of foreign-exchange reserves provides it with an important buffer against a classic currency and liquidity crisis. To be sure, China’s reserves have fallen enormously—by $700 billion—in the last 19 months. Given China’s recent build-up of dollar-denominated liabilities, which the Bank for International Settlements currently places at around $1 trillion, external vulnerability can hardly be ignored. But, at $3.3 trillion in December 2015, China’s reserves are still enough to cover more than four times its short-term external debt—well in excess of the widely accepted rule of thumb that a country should still be able to fund all of its short-term foreign liabilities in the event that it is unable to borrow in international markets. Of course, this cushion could all but vanish in a few years if foreign reserves were to continue falling at the same $500 billion recorded in 2015. This was precisely the greatest fear during the Asian financial crisis of the late 1990s, when China was widely expected to follow other so-called East Asian miracle economies that had run out of reserves in the midst of a contagious attack on their currencies. But if it didn’t happen then, it certainly won’t happen now: China’s foreign-exchange reserves today are 23 times higher than the $140 billion held in 1997-98. Moreover, China continues to run a large current-account surplus, in contrast to the outsize external deficits that proved so problematic for other Asian economies in the late 1990s. Still, fear persists that if capital flight were to intensify, China would ultimately be powerless to stop it. Nothing could be further from the truth. While Chinese authorities have no desire to close the capital account after having taken several important steps to open it in recent years, they would most certainly rethink this position if capital flight were to become a more serious threat. Yes, China has stumbled badly in the recent implementation of many of its financial reforms. These missteps should not be taken lightly—especially in light of China’s high-profile commitment to market-based reforms. But in light of impressive progress in the early stages of China’s structural rebalancing, its recent financial accidents do not spell the hard landing that many believe is now at hand. China’s financial markets—at best a hybrid confection of marketized Leninism that mixes together elements of real markets and a government-managed casino—have not only recently been sending tremors through China, but unnerving global markets as well. Gone are the days of Mao Zedong’s “self reliance,” (zìlì gèngshēng / 自立更生) when China’s economy was an autarky and global markets, such as they were, paid little attention to Beijing’s economic successes and failures. However, now that enthusiasts of globalization have woven an ever-tighter fabric of interdependence between all the world’s major economies, what happens in China matters elsewhere. For better or worse, we are all in a common enterprise from which there is no escape. And so, when one of the global market’s arch prognosticators, financier George Soros, who until recently was quite bullish on China, suddenly ups and says, as he did at Davos last week, that “A hard landing is practically unavoidable” for China, and that he’s not only “expecting it,” but “ I’m observing it,” we ought to at least wonder how he arrived at his judgment. What factors would make one come to such a bearish conclusion? It is undeniably true that China’s rather immature financial markets are not coterminous with its economy. One does not equal the other. Here Stephen Roach is right when he says (above), “Time and again, momentum driven investors draw erroneous economic conclusions on the basis of pyrotechnics in financial markets.” China’s economy has a quarter of a century of real and impressive expansion and continues to register a growth rate of just under 7% that remains the envy of most countries. In short, it remains a global economic powerhouse. But as we watch China’s financial markets seesaw up and down once more, what we should pay attention to is Beijing’s reaction to this challenge and what it tells us about how the Chinese Communist Party’s almost autonomic response mechanism has sought to handle past crises in their financial markets and, thus, when economic push again comes to shove, how officials can be expected to react when challenged elsewhere. Party General Secretary Xi Jinping may have publically proclaimed that market forces must be allowed to play a greater role in the allocation of capital, but when the economy actually comes under siege, the Party’s response seems to inevitably be to marshal massive state intervention, greater regulatory controls, and more manipulation of the press. We saw these dynamics first come into play last summer when China’s Shanghai and Shenzhen stock markets went into meltdown. And then we saw the same response come into play again when a second bout of panic selling erupted this winter just as certain market restrictions (preventing larger corporate share holders from selling large blocs of securities) were scheduled to be lifted. As Arthur Kroeber suggests, such behavior raises real concerns about the Party’s abilities to effect the kind of deep economic reform Xi Jinping claims he supports and that the economy now sorely needs. However, if it pleases Xi to continue playing a version of China’s latter day “great helmsman,” (dà duòshǒu / 大舵手)—a leader so invincible that he is always capable of seamlessly controlling all aspects of Chinese life—there will be an ineluctable tendency for him and the Party to react reflexively in often retrograde and counter-productive interventionist ways every time a major economic crisis approaches in order to keep up appearance and preserve official face. It is this dynamic of avoiding both tough decisions and the unpleasantness of passing disarray that could continue to militate against the government’s ability to push through comprehensive economic reform. From this perspective, it is logical to look at how the Party has been responding to the recent series of crises in its financial market sector, because it helps us extrapolate how it will probably respond to other crises in its economy as a whole. In this sense, China’s admittedly epiphenomenal stock markets may viewed something like a petri dish in which we can see one very telling experiment in progress that shows the Party’s willingness to actually let market forces play a more significant role in China’s economic future, especially when they may lead to large corrections. Alas, as Arthur Kroeber has pointed out, recent government actions do not suggest that Xi’s apparatus is flexible or risk-tolerant enough to actually allow really meaningful market reforms to take place, especially in a crisis situation. “There are strong reasons to doubt that the government of Xi Jinping is really committed to crucial market-oriented reforms, because these would require an unacceptable dilution of Communist Party power,” says Kroeber. “Until Xi steers a credible course in favor of markets, the world will endure more China scares and global financiers like Soros will turn bearish. Instead of reading Soros’s admonition as a warning that markets are wary of China’s management style, the Party seems to view it as a threat, and has gone into attack mode. But this is precisely the self defeating mindset that has led it also to prop up a dysfunctional status quo of its financial markets over the past year, when what was really needed was to allow market dynamics to establish their own new equilibrium, even if that involved a temporarily much lower evaluation, and significant dislocation. As the classical Chinese expression warns, it is always dangerous to: “Sacrifice what is fundamental only to gain what is peripheral” (shěběnzhúmò / 舍本逐末). In a way, Soros was even more negative on China’s hard landing than news reports indicated: “I’m not expecting it,” he said, “I’m observing it.” And yet, the very next words out of his mouth were: “China can manage it. It has resources and greater latitude in policies, with $3 trillion in reserves.” Do I detect some agreement between Kroeber and Roach here, amidst the headlines and nervous markets? Neither of them agrees with Soros that we are “observing” a hard landing, and I’m not sure either of them shares Soros’ confidence that China “can manage it,” either. The real data don’t show a hard landing; indeed, there is some evidence of improvement, or at least stabilization, in the real economy data over the past couple of months. Besides, China’s getting ready for New Years, and the place will spend next week shutting down and heading home for the holidays. No hard landing in China over Chinese New Year. Not enough people in the office. Still, our commentators are united by anxiety as well, an anxiety shared by world markets, and which I also share. Kroeber acutely describes his sense of a China that is “losing its way.” World markets can perhaps be criticized for over-reacting to financial events that are not necessarily relevant, or for shallow understanding of China. But so what? What markets are really reacting to is the sense that events in China are evolving in ways barely understood, and which Chinese policy-makers have been doing a remarkably poor job in managing, much less explaining. It’s not just the stock market and the exchange rate: the outcomes of other major policy initiatives last year were also extremely disappointing, including the massive program to restructure local government debt and the roll-out of an official program of state enterprise reform. Everybody makes mistakes, but when a political system fails to carry through with three or four of its own most important initiatives, you have to ask whether that policy process is broken. If the Chinese system retains its flexibility and rationality, as well as its stated commitment to economic reform, we would expect to see a major “re-launch” of reform initiatives this year. It is even possible that we are seeing just such an effort right now with the new “Supply Side Structural Reforms,” which have announced a much more aggressive plan to tackle excess capacity and excess debt, the twin problems looming over the Chinese economy. Is this the opening wedge of a re-tooled reform initiative? Yesterday, the Shanghai stock market fell below its January 1, 2015 level. This could just be more bad news, or it might mean that Chinese policy-makers are abandoning the attempt to prop up the market, which would ultimately be good news. One can only guess, or hope. If Chinese media could discuss these issues openly, we could get some insight, but instead they launch attacks on George Soros, which explains why the anxiety persists. George Soros is hardly an expert on China. But I largely agree with him. Before 2013-14, it was almost too easy to forecast China's economic growth because even blind optimism would work just fine. Back then, the Chinese government had many tools that worked and also debt and structural problems were not yet so stretched. However, since 2014, not many tools have worked. In order to achieve must-have growth, they keep stretching the limits even when the tools carry disproportionately high costs. First,the structural problems which have accumulated over decades and especially since 2008 are just tremendous. Yes, by share of GDP, the service sector has gained while the industrial sector has lost in the last couple of years, which is why some have been busy declaring “success in China's rebalancing and restructuring.” But that is more a result of simple math, not real progress in active rebalancing. That is, when we divide the GDP pie into three pieces (agriculture, industry, and service) in percentage terms, their percentage shares have to add up to 100%. As a result, even if there is no progress in rebalancing and structural improvement (in terms of resource allocation and efficiency) at all, you can still see the service sector's share gaining at the expense of the industrial sector even when all sectors are slowing down except that the industrial sector is slowing down more. China is still over-investing in inefficient industrial projects, which has made the overcapacity problem worse in almost every industry, resulting in ever widening losses for industrial firms. The fact that the Producer Price Index has declined (year over year) for more than 48 months is indicative of this. It would be foolish to rely just on output percentage shares to draw conclusions on rebalancing progress. Investment is still the most important driver of growth in China. If one does not believe me, talk to any mayor or local government official. Second, given that more than 80% of China's financial assets are in banks, investment-driven growth is just debt-driven growth in another name. As China almost always goes back to the investment machine whenever they face a growth challenge, debt has grown fast and will continue to grow. Deleveraging is talked about in academic discussion rooms but not practiced. So debt is still rising. This will not change. Third, it used to be that almost all non-performing loans (NPL) would be worked out by local officials. But it’s not so easy any more. One key determinant is real estate prices. As long as real estate was the quickest road to become a billionaire, the local governments had the best weapon to deal with NPLs: land for real estate development. All land is state- or collectively owned and fully monopolized by local governments. Thus, local officials could easily get someone to bailout a delinquent borrower by offering him or her a piece of land for real estate development at a token cost as almost everyone would jump at such an opportunity. But with the struggling real estate market (another overcapacity industry), local governments have lost their best weapon. This is why more debt insolvency problems have surfaced and many more will show up. Fourth, the anti-corruption campaign has totally changed the incentives for government officials and SOE executives. They were all motivated to be innovative and proactive in using their power at hand to start new projects and maximize economic growth. But now they all try to minimize risks by doing nothing real. This is also why most of the 60 reform decisions made at the Third Plenum of the 18th Party Congress have not been implemented even after more than two years. China of today is in a different regime than three or 13 years ago. With the disincentives for proactive governance/decision-making, further economic slowdown is a given. In short, the structural and debt problems in the Chinese economy are not accidental but consistent and endogenous to its institutional setup. Unless the institutional setup is fundamentally reformed, no real change will take place until a hard landing occurs. “Articles are appearing across the world debating whether Mr. Soros and his putative wolf pack will succeed in doing to the People's Bank of China (PBOC) what he did to the Bank of England in 1992—in the latter case with entirely positive consequences. In fact, Mr Soros issued no such “declaration of war,” and nor is he so foolish as to take on a foreign exchange superpower and net global creditor with $3.3 trillion in foreign reserves. As it happens, I was at the dinner at the Hotel Seehof in Davos—drinking white Rioja—where Mr. Soros supposedly revealed his plot. What he did let slip is that he had been shorting some Asian currencies—the Malaysian Ringitt or the Thai Baht, perhaps, out of nostalgia for the 1998 crisis. The Chinese economy has been struggling for years and there have been several international panic attacks about it since Xi Jinping came to power in 2012. Each time policymakers have managed to find a way to muddle through. Can they do it again, or has something changed? Over the last 18 months those economic policymakers once so respected internationally have made a series of serious mistakes. So were they never actually that competent but just looked smart because there was so much low hanging fruit and so many people wanted to believe they knew what they were doing? Is China’s economy such a mess now that they have no good options left? Or has the policy-making process broken down under the centralization of decision-making under Xi Jinping, what with the diversion of attention to ideological work with shades of “better red than expert” amidst an ongoing cadre cultural revolution? Broken down under an exodus of experienced financial regulators to both better opportunities in China’s financial sector and interrogations in padded cells? Broken down under the suffocating pressure of Wang Qishan’s Central Commission for Discipline Inspection (CCDI) inspection teams that justifiably went into all the financial regulators and top financial firms after the stock market crash? My guess is that the centralization of policymaking under Xi and the unrelenting corruption and discipline crackdown—now expanded to an ideological purification campaign led by CCDI—have combined to create an environment of such fear, distrust and stovepiping that the policymaking processes that once worked reasonably well have degraded significantly. Some have argued that China has a communication problem but the issues look to be much more fundamental. Xi is making it clear that politics, not markets, are in command (政治挂帅), and that core contradiction with the function of markets materially increases the odds of a hard landing. China’s policymakers have pulled rabbits out hats before, but I am betting the upcoming Year of the Monkey has at least even odds to turn into more a year of the bear than a year of the rabbit. Somewhere close to the heart of the problem is this reality: overall credit, including that of non-bank financial institutions in the shadow banking world is variously estimated to exceed 300-400% of GDP. And, just as overall growth has slowed considerably, credit growth has risen quite dramatically. If one is to believe the kinds of experts Soros tends to consult, the ratio of change of bank assets to GDP is 6.4 X. And, if one also factors in off-balance credit assets, the ratio is reported to skyrocket to 9 X. And since a lack of transparency makes it difficult to know either who holds these monetary liabilities or their real nature, this substantial overhang represents a dangerous unknown. The real question then is how China’s banks—that have already been purged once of massive bad debt by having non-performing loans off-loaded into “asset management corporations”—can survive a continuing expansion of policy driven credit on the scale that is needed to keep SOEs solvent and employment up. In short, the size, nature and threat of China’s aggregate bank liabilities is both large and opaque. It is all well and good to blame George Soros and other “hostile foreign forces” for whatever ails China economically, but actually China’s dilemma is Chinese-made. China’s banks, used for too long as a convenient flotation device for China’s economy, are now challenged by a very delicately balanced macro-situation that may be far more fragile than most have cared to acknowledge. And in the fearful climate in which very few officials dare take the kind of bold risks that real economic reforms require, where the financial media has been scared by the consequences of honest reporting (as we have seen in the Party’s handling of the recent stock market crises), and where major new economic perturbations are bound to arise, one can only wonder from where the necessary leadership will come. The last spate of bold economic leadership was under former Premier Zhu Rongji, who served from 1998-2003 and was given enormous leeway by then Party General Secretary Jiang Zemin to act as he saw fit in managing the economy. And, he was the last Chinese leader to succeed in implementing really meaningful economic reform. Under the newly centralized leadership of Xi Jinping, it is hard to see from where such economic leadership could come, except from Xi himself. Unfortunately, he already has his hands more than full. So, as Chen Zhiwu bluntly notes above, stimulus led growth fueled by more bank-led loans to SOEs, “will not change.” If it does not, it is difficult to see how China gets out of its trap. To accomplish such an ambitious reform, the banks must be relieved of the burden of being handmaidens to Party, always subject to answering their endless and urgent commands for bailouts. We must recognize that we are seeing leadership weakness, not strength, in the People’s Daily “Ha, ha” warning to George Soros—weakness that is increasing the chance that the current difficult economic transition will be far more painful than economics alone would suggest. The eroding commitment to market-based reforms and rule of law are already casualties of this storm, a storm that has politics at its center. China is at a dangerous moment. The danger is that its elites are losing faith. They are scared, demoralized, and uncertain in a way that they haven’t been since the 1989 Tiananmen killings. Many of them have come of age during the quarter-century of prosperity since Deng Xiaoping’s Southern Tour of 1992, and have known nothing but economic growth. They’ve traded political freedom for increasing social openness and continued prosperity. Now the rules are changing. Business and financiers are being detained in unprecedented numbers. Government decision-making has slowed dramatically. For the first time in more than a quarter-century, a generation, there is real uncertainty about where the country is going and what the new rules will be. China’s leaders have always worried that an economic slowdown could lead to social unrest. I’ve never believed that. And I still don’t. But the combination of economic slowdown and erratic but widespread political tightening make this a particularly volatile time, one that raises the possibility of an economic crisis. In China, a pre-New Year’s scramble for cash is taking place even as companies and individuals try to move money out of the country. Capital flight is difficult to quantify but the buzz in Hong Kong is about companies doing anything they can to move money abroad. No doubt some of this is good cash management, such as currency and risk diversification and foreign loan repayment. But a powerful driver is to get the cash out of reach of mainland authorities. Arthur Kroeber makes the excellent point that nominal growth has decelerated dramatically. I would add that the slowdown is felt even more keenly in China itself, where companies often were seeing nominal sales increases of more than 25% a year. As the good ones added market share, growing faster than their industry, they had an impact on overall economic growth and inflation. In that go-go environment, traditional business management wasn’t what was needed. Those who dared, those who borrowed, those who cultivated political connections to get licenses, and those who expanded, were the winners. Now, the ability to manage in a cash-constrained environment is what matters. The increasing complexity of the Chinese economy should also be emphasized. One little-reported aspect of the run-up in share prices in early 2015 was the importance that the informal financial system, including peer-to-peer financial networks such as Alibaba’s ANT, played in lending cash to investors. This margin financing acted as rocket fuel in powering the market. Yet it took authorities some time to understand what was happening and longer to act. There’s nothing uniquely Chinese about this, but it serves as a reminder that the world’s second-largest economy is difficult to understand, yet alone mange. More economic management, and a firm check on market forces, is the direction of the current administration. Ultimately, the problem is not George Soros or foreign speculators. There is nothing inevitable about a Chinese crisis. The economic challenges can, with leadership, be dealt with. The core of the problem is the ability of Xi Jinping and his administration to show a path forward for an economy in the midst of transition. China’s political discourse is littered with numbers. The “Three Anti” campaign was Mao Zedong’s attempt to root out capitalist sympathizers. Former President Jiang Zemin attempted to rectify backward party members with his “Three Stresses”—study, politics and righteousness. “Eight Honors and Eight Shames” was former President Hu Jintao’s contribution to cleaning up corruption. No, the yuan is not about to spiral downward. From Mexico in 1994 to Turkey in 2001, the history of emerging market currency crisis is one of high foreign debt and low foreign exchange reserves. China’s situation is the reverse. Foreign debt is low and at $3.3 trillion the People's Bank of China’s reserve stash provides a significant buffer. No, the collapse in the equity market does not mean the economy is doomed. The busted boom of the Shanghai Composite Index reflects mismanagement of margin finance, not economic fundamentals. No, China is not on the brink of a financial crisis. True, economy-wide debt has risen to nose bleed inducing heights—more than 230% of GDP according to Bloomberg Intelligence Economics’ calculations. But most of it is domestic, and between different arms of the state family. That gives China scope to manage the problem down, rather than having it blow up. No, China's real economy is not collapsing. Growth has certainly slowed sharply from its pre-crisis levels, but in 2015 it stabilized. Our monthly GDP tracker ran above 6.5% year on year in the second half, and even accelerated slightly at the end of the year. Tailwinds from monetary and fiscal stimulus will continue to support growth in early 2016. No, the reform agenda has not stalled. The Party is not going to let go of commanding heights of the economy. But the trajectory from a relatively inefficient state-dominated system to a relatively efficient market-directed approach remains in place. A case in point—in 2015 the central bank completed liberalization of interest rates. China’s economy continues to face major challenges. Bloomberg Intelligence Economics expects growth to slow again in 2016 and in the years ahead, on a path to mid-single digits by the end of the decade. Without successful reforms, the slowdown will be more severe and the chances of a crisis will rise. But the problems in the market are not a “tell” on the true state of the economy. With policy space remaining, muddling through remains the most likely scenario.